George and Lillie Gallagher in their home. Lillie Petit Gallagher’s heritage is deeply rooted in the French culture of South Louisiana. Her father’s family owned the only general store in the predominantly French-speaking community of Cutoff. Her mother’s family owned a restaurant in the same town. Lillie and her husband, George, celebrated her rich cultural background through a gift to her alma mater that honors her parents. George was an ExxonMobil engineer, so the couple was able to leverage the company’s 3:1 educational matching gift program to establish the Lillian Defelice and Sampson J. Petit Professorship in French for Business. Lillie shared, “My whole family had been in business, so I wanted to establish an opportunity for French and business to be explored and used in whatever way it could help LSU’s French department,” she shared. 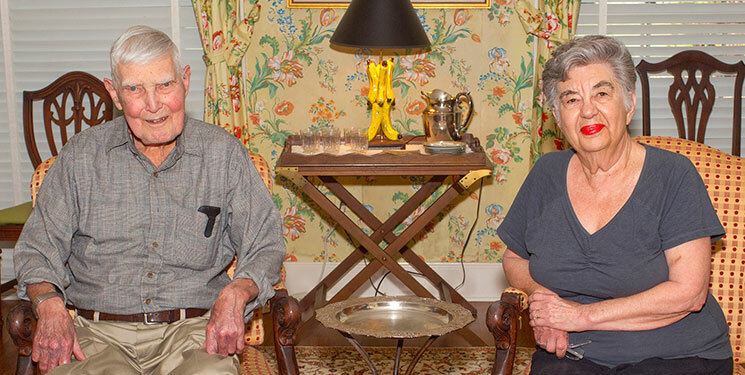 The matching program is available to both current and retired employees and their annuitants, which recently enabled the couple to celebrate Lillie’s roots even more deeply. Lillie said they decided to create a scholarship partly because George attended college on a scholarship. “Had he not had the opportunity to go to school on scholarship, he probably would not have had the opportunity to go to school and have an engineering degree, which then went on to a 50-year association with Exxon,” she said. She added that George’s career provided travel opportunities that allowed them to see much of the world. She and George are grateful for these opportunities, and are passing them on to students. The Lillie Petit and George Clark Gallagher Scholarship in French Studies will provide students with funds to supplement tuition or travel.